Coding, Ranting and … stuff? 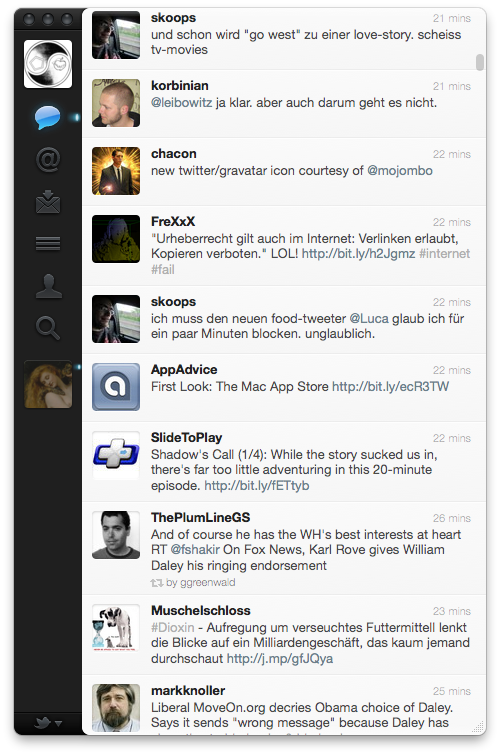 Twitter.app – the great and the meh. The UI is just great. I thought hard about this and it’s definitely the most gorgeous app I’ve seen so far. Beside that it has lots of very nice features like multi-account support, nice shortcuts, on the fly URL shortening etc. It won’t tell you anything if it encounters errors. Meh. It doesn’t mark an Tweet after a Retweet. This means that you can’t see if the Tweet was really retweeted or couldn’t get retweeted because you already retweeted it earlier. Since your own Retweets won’t show up in your timeline it’s also not possible to unretweet a Retweet. Meh. It does not allow using an URL shortener other than t.co. The problem is that I actually like j.mp very much for the statistics feature it provides. Given that t.co is the official Twitter-owned and -run URL shortener this isn’t likely to change in future versions… I could probably live with this but it will make posting links more of a burden than before since I WILL keep using j.mp/bit.ly…. Meh. Growl notifications are not always working. Meh. It does not show @mentions in the Mentions section if your @username is anywhere else but at the start of the Tweet . This was the final nail in the coffin for the whole app. Everything else was just Meh but this issue is OMGWTF! The Live streaming of Tweets gets stuck and won’t restart afterwards. No more updates until restart of the app. This is a major Meh and a serious OMGWTF!! Is there a chance that those issues get fixed in a future version? I hope so. Six Mehs, two OMGWTF! and lots of tears because the rest of the app is that good. Meh. The @mention issue mentioned above has been fixed in 2.0.1. This entry was posted in Uncategorized and tagged English, Mac, Twitter by Huxi. Bookmark the permalink. Atm your quite right about your Mehs and OMFGWTFs. Anyways I’m sure aboute that a lot of this subjects will be solved soon, as it is now THE official Twitter app with a lot of new users by now. What’s especially disappointing is that there’s no place where twitter accepts feedback for its client. I for one am missing color indications of which tweets are not marked “read”, also I’m missing filtering by blacklisted words and I’m missing an unread tweet number in the dock. Until those are fixed, I’ll still need to resort to uglier looking clients like Syrinx.